The glamour of Hollywood makes a fun party theme. Perfect for a couples party, girls night or Oscar-night celebration, a Hollywood-themed party mixes elegance and fun. Prepare as much as you can ahead of time so you can enjoy the night with your guests. Bring Tinseltown to your town with these party ideas. Create cute invitations that look like passes to a VIP party. A sprinkling of black, white and gold confetti in the envelope with your invitation is a festive touch. 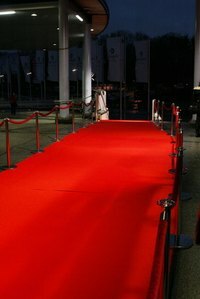 Place a length of red fabric or carpet in the entrance to make guests feel like stars. Take photographs of guests as they enter (think paparazzi). The photographs will make fun mementos for guests to take home. Create elegant table settings with red or black tablecloths and coordinating napkins. Mark each place setting with an inexpensive gold plastic trophy from a party supply store. Add a guest's name to each trophy for a creative place setting. Accent nearby plants and trees with strings of clear holiday lights. They will add instant sparkle to the party area. If you have access to a small floodlight or small spotlight, set it up to shine on the food table. Serve a swanky dessert buffet, including a selection of brownies and cookies, cheesecakes, fruits and more, a soiree suitable for the finest celebrities. If you prefer a sit-down dinner, serve a fresh Caesar salad and a pasta dish. You can make these for a crowd, and most guests will love them. For an unexpected twist, set up movie snacks at stations throughout the party area. Popcorn, chocolate-covered raisins and peanuts, and gummy candies are perennial movie favorites. Serve beverages in champagne flutes. Even sparkling water is festive in a champagne flute. Play a collection of movie theme songs during the event. Your guests will enjoy trying to match the song to the movie. Choose a wide selection of years and genres so all of your guests will hear familiar songs. Request that guests wear their awards-night finest to the event. Another option is to ask guests to dress as their favorite movie stars for the night. Either way, you will end up with spectacular pictures from the evening. Print out color photos of celebrities, add "autographs" with flair pens and tape them up around the room. You can also find movie posters, celebrity stand-ups and other promotional movie items online to place around your party room. Your guests can have their picture snapped standing next to life-sized stand-ups of Will Smith or Jessica Simpson. Create a smaller version of the famous Hollywood sign by purchasing white letters and spelling it out on hard cardboard or easels.